Money is meant to circulate. And its circulation is what we call the economy. On November 8, Prime Minister Narendra Modi, in an unexpected televised speech, put a curb on this circulation. The government demonetised currency notes of rupees 500 and 1,000 denominations. These notes accounted for 86 per cent of the currency notes in circulation. 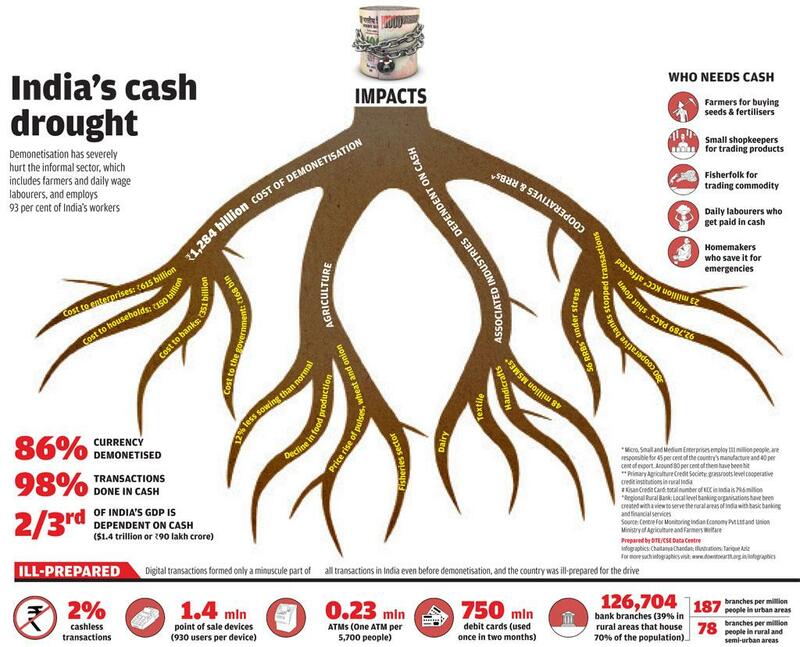 In a country where 98 per cent of retail transactions are made in cash, it was like a cardiac arrest for the system. Its impacts on the rural economy are the most worrying, especially because it is uncertain when the economy will be back to normal. There is a certain seasonality to the rural economy. Demonetisation happened at the time of maximum cash transactions. Farmers were harvesting and selling a bumper kharif crop, after two consecutive drought years. They were also preparing for the rabi crop, the all-important crop to earn that precious cash that would sustain them till October next year. According to farmers’ own estimate, during October-November they conduct close to 85 per cent of their cash transactions in a year. Electronic payments account for just 2.5 per cent of all retail transactions in the rural economy. The informal sector accounts for 93 per cent of the total employment. This is where demonetisation proved to be a disruption of unheard proportion (see ‘India’s cash drought’). Take Tejpal Shaini, a farmer of Pabsara village in Haryana’s Sonipat district. After harvesting paddy in October, he took the first step towards prosperity by deciding to go for vegetable crops for quick earnings. He took up fenugreek and coriander in nearly a hectare of land each. “Winter crop is my insurance against debt,” he says. Shaini took a loan of Rs 3 lakh for agriculture. He would have repaid the loan with the earning from the rabi crop, after keeping aside some money for the education of his grandchildren. But immediately after demonetisation the vegetable prices crashed. Usually, during this time vegetable prices are low due to oversupply. But in the absence of cash, the demand also decreased drastically. Delhi’s wholesale markets reported 50 per cent dip in sale during November. “Leave the profit, I will not recover the cost,” Shaini says, adding that he is unable to pay the labourers, who are still working in his fields. For fenugreek, Shaini spent Rs 12,000 on seeds, Rs 2,000 on medicine and pesticides, and Rs 6,000 to prepare the farm for cultivation. Nine labourers work on his farm, each costing him Rs 220 a day. To harvest his one-hectare fenugreek, these labourers have to work at least 15 days. This means Shaini has to pay them Rs 29,000. To transport the harvest to the Azadpur wholesale vegetable market in Delhi, he spends Rs 2 per kg of fenugreek. The commission agent in the market takes Rs 20 for every 50 kg of fenugreek. For his entire crop the investment comes to about Rs 61,000, but due to the price dip he has earned just Rs 36,000. This is almost a loss of 59 per cent. “Farmers have been punished for no mistake,” he says. 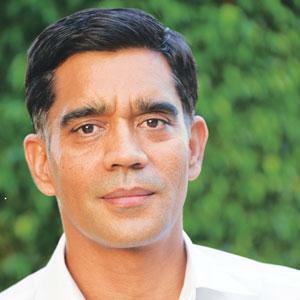 Balram Singh, vice-chancellor of Jodhpur Agriculture University, says, “Farmers, especially those cultivating vegetables, are facing a crisis. They are being exploited by everyone because they deal in perishable items.” Farmers were told to either take old notes or return empty-handed. “Exchanging the old notes is quite a challenging task in rural areas because the cash crisis there is worse than in urban areas,” Singh says. In Maharashtra that is crawling out of a crippling drought this year, demonetisation is being termed a “monetary drought”. Arvind Tagde of Kundali village in Nagpur district wanted to cultivate wheat to ensure food security for his family but could not do so because he did not have enough cash to buy seeds and fertilisers. In desperation, he bought the produce of an orange plantation on a credit of Rs 32,000 and spent another Rs 8,000 on transportation and other expenses. “My market reading was that this year the orange production would be less, thus, the price would be high,” he says. But due to demonetisation, the demand of oranges decreased significantly. In distress, he sold his total harvest of oranges for Rs 25,000. “It is a loss of around 40 per cent,” he says. 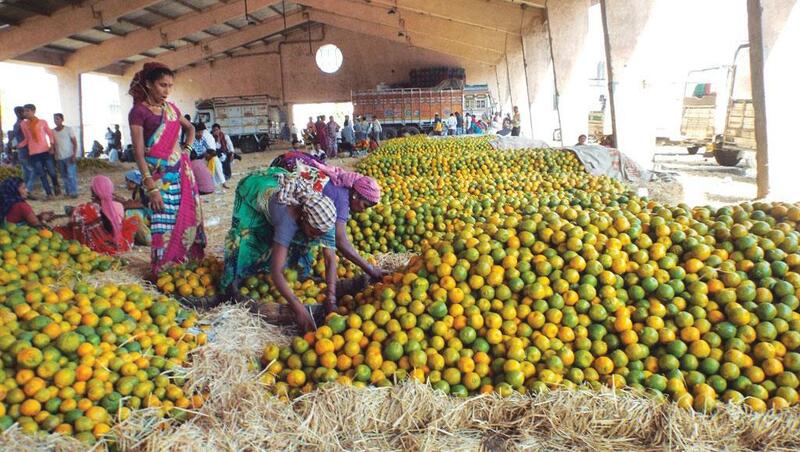 The Karamana market in Nagpur, one of Asia’s largest orange markets, has reported just over 50 per cent trade at the peak of the business season. Tagde is staring at a long-term financial distress that almost threatens his family’s food security. Since he did not cultivate wheat, he does not have foodgrain in stock to take care of his family’s daily needs. He has to buy it from the market. But money is in short supply. Can he go back to wheat cultivation now? What adds to his cup of woes is the collapse of cooperative banks, the usual source of loans for farmers like him. Cooperative banks are not in operation due to demonetisation. In Maharashtra, about 28 per cent of the farmers get credit from cooperative banks. It is almost double of the national average. The Reserve Bank of India (RBI) has debarred cooperative banks from the currency exchange business. They have more than 10 million customers, especially in rural areas, with a deposit of Rs 1.27 lakh crore. At present, the Supreme Court is hearing a case demanding that the government should relax RBI norms for cooperative banks. On December 3 during a hearing, the court was informed that 371 district cooperative banks had shut down after demonetisation. After a week of demonetisation, the government woke up to the problems farmers were facing in buying the seeds of winter crops. It allowed use of old notes for this. But it is not helping. Take the example of the usually busy seed sale counter at Meerut’s Sardar Vallabhbhai Patel University of Agriculture and Technology. By the first week of December, the seed centre did not receive any official order to allow farmers to use old notes for buying seeds. It still decided to receive old notes. Now banks are not allowing the university to deposit the old notes. Officials say that banks don’t have the government directive. In 2014-15, the seed centre sold 110 tonnes of wheat seeds. The sale has come down to just 20 tonnes this year. “It is possible that farmers are using their own seeds. Those are not that productive and may bring down production by 12-17 per cent,” says Ashok Kumar, research director at the university. Demonetisation has also hit India’s cottage and small industries around agriculture. These industries process final products around this time. 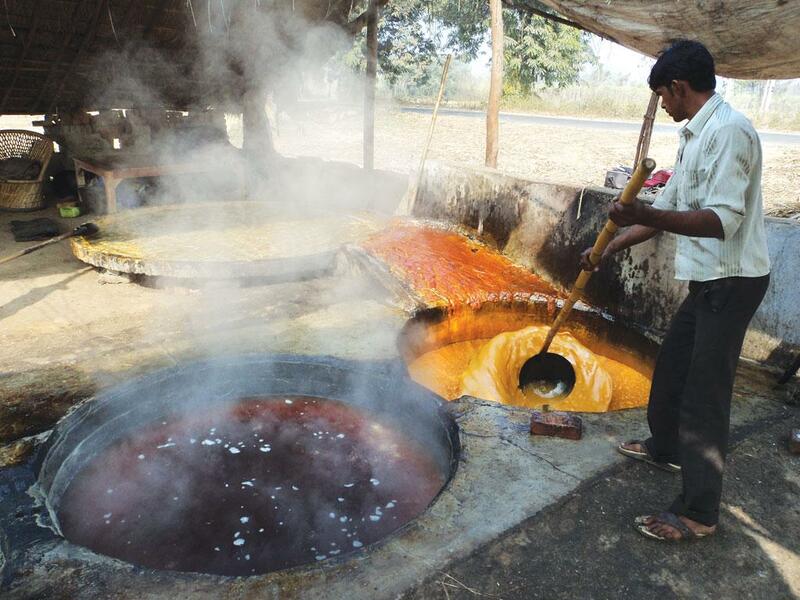 In Uttar Pradesh, the jaggery industry is on the verge of collapse. The state has the maximum number of traditional jaggery units in the country: of the total 40,000 units, it has 23,000. In Uttar Pradesh, these units employ close to half a million people. The jaggery business is entirely cash-based and mostly run by small and marginal farmers. In western Uttar Pradesh, many jaggery units have stopped production. Their owners are not able to buy sugarcane from farmers because of the drop in the sale of jaggery. As these units closed, the workers also lost job. Though they get 15-20 per cent less, farmers prefer to sell sugarcane to jaggery units because they get money instantly, while sugar factories take months, even years, to clear dues. After a month of old notes being declared illegal, 15-20 big jaggery wholesale markets have stopped trading. These include Muzaffarnagar, the country’s biggest jaggery market. India’s second biggest jaggery market, Anakapalli in Visakhapatnam, has also closed down. Traders there say this has happened for the first time in living memory. This disruption is showing up in terms of India’s agricultural performance. When the Union Ministry of Agriculture and Farmers Welfare reassured the country on December 2 that no impact is visible on the ground, especially regarding the sowing of the rabi crops, it did not lie but misled the public. The ministry compared the sowing in the current rabi season after a good monsoon with the previous year’s sowing that followed a severe drought. The sowing pace is, therefore, obviously better. 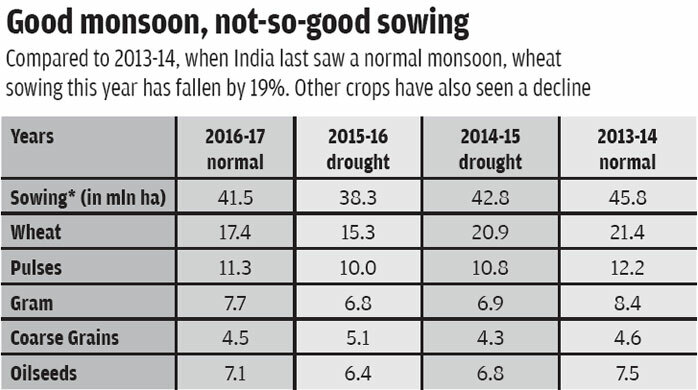 The current sowing trend, which is at its fag end, is poorer when compared to the rabi-sowing season of 2013-14 after the last normal monsoon (see ‘Good monsoon...’). That year India reported the highest production of foodgrains since Independence. Since then, grains production has declined due to consecutive deficient monsoon causing severe drought. This is where demonetisation is going to wash away the benefits of a normal monsoon after three years. Demonetisation happened when farmers were in the middle of selling the kharif produce and preparing for the rabi sowing. The acreage has sharply reduced when compared to normal monsoon years. 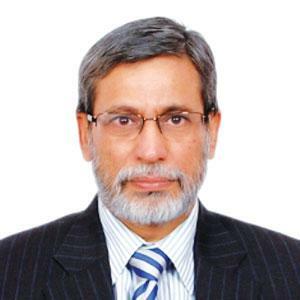 “The sowing of rabi crops as on November 18 was 11.5 per cent lower than the average of the past five years. 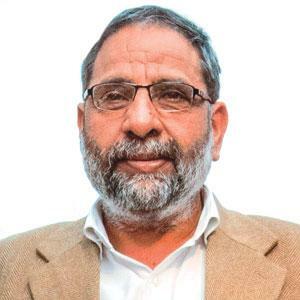 We should not compare the area sown this year with last year’s as the residual moisture is much better than last year due to good monsoon in most parts of the country,” says Siraj Hussain, former secretary, Union Ministry of Agriculture and Farmers Welfare (see ‘Demonetisation to hit small farmers’). The current year is also important from the point of India’s food security. The rabi season is primarily known for wheat and pulses. This season has been seeing extreme weather for the past three years. This has reduced the production of wheat and pulses. The shortage of pulses, in turn, has shot up the retail prices. 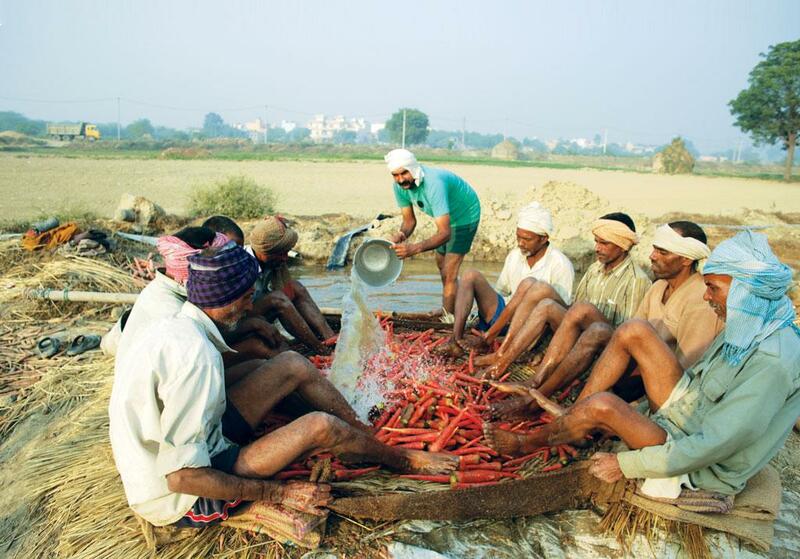 This attracted farmers to grow more pulse crops in the kharif season, resulting in record sowing and production. The acreage of pulses shot up by more than 30 per cent. The country was set to have another season of record pulses production but demonetaisation came as a dampener. In the rabi season the acreage of pulses has reduced. In case of gram it has decreased by about 10 per cent in comparison to a normal year. The price of wheat is also rising. Since October, it has gone up by 25-30 per cent. In the past one month the price of wheat flour rose from Rs 190 per tonne to Rs 240. The forecast of a warm winter is another bad news since wheat requires low temperature to flower. Since the sowing this year has been low, the government has removed import duty on wheat to ensure that the supply remains sufficient. Firms making fast-moving consumer goods had been expecting a rise in demand in the wake of good monsoon after two years of drought. But demonetisation has slowed the demand. Rural areas have only one-fourth of the ATMs in the country. Cooperative banks, which are closer to the rural population, have almost shut down. Agriculture scientist M S Swaminathan also thinks that the timing of demonetisation is proving worse for farmers. It has created difficulties in getting credit for seeds, fertilisers and energy for rabi crops. State governments should immediately prepare a demonetisation management package for agriculture and streamline credit access and delivery mechanism, he says. On December 7, RBI lowered its gross domestic product forecast for 2016-17 from 7.6 per cent to 7.1. The reason, probably, is the slowdown expected in agriculture in the coming months. Can digital villages inspire transition to cashless economy?